For someone who never actually set foot inside Old Trafford, Malcolm Glazer casts an extraordinarily large shadow over Manchester United. Yet there is unlikely to be any outpouring of grief, of the type that drew thousands of fans to the stadium concourse to pay tribute to George Best in November 2005, following the American businessman's death on Wednesday at the age of 85. For only six months prior to the passing of arguably United's greatest player, Glazer had completed a takeover as controversial as any ever seen in British sport. Glazer's stewardship split the United fan base. Some were ambivalent, preferring to concentrate on matters on the field. The majority were vehemently opposed. There were plenty - including, memorably, David Beckham - who maintained their association with United but made their feelings plain by wearing the green and gold colours of the club's first ever strip, which protestors adopted as their uniform of choice. More militant figures left completely. Those responsible for its establishment maintain that FC United - based in Moston in Greater Manchester and now members of the Northern Premier League - was not formed in direct response to the Glazer takeover but as a result of the growing globalisation of the national game, which took it away from its traditional fan base. Yet the fact remains that the fan-owned non-league side's first game was played in 2005, just weeks after the takeover and before Best's passing. The reason for all the antipathy? Money. In buying out major shareholders John Magnier and JP McManus, who had fallen out with Sir Alex Ferguson over the ownership of star racehorse Rock of Gibraltar, Glazer was effectively in the process of completing a £790m takeover with the club's own cash. The prospect so alarmed some fans on the night the deal was completed that hundreds arrived at Old Trafford to voice their opposition, forcing three of Glazer's six children - current co-chairmen Joel and Avie, plus non-executive director Bryan - to be spirited out of the stadium in a van for their own safety. In addition to the actual £525m debt dumped on the club's balance sheet after the takeover, it is estimated around £696m has been spent facilitating it, through interest payments, bank charges and debt repayment. United have gone from being the richest club in the world to the one that owes the most money. Yet financial Armageddon, predicted by so many, failed to materialise. For Glazer had been proved correct in his assessment of United as a cash cow, capable of generating vast sums in commercial income, which rose to a staggering £152.5m last year and will take another substantial leap forwards when the club's annual results are released in September. In adopting a franchise-based approach to their commercial operations, United opened the door to untold riches. Ed Woodward, now executive vice-chairman, who drove through the Glazer takeover, set about maximising the club's off-field potential. It brought alliances with airlines, tyre companies, watchmakers and crisp manufacturers, amongst others, taking United's brand into every corner of the globe, hunting down the 657m followers it is claimed they have. The policy set the template every other major club has followed. Crucially, in those early days, Ferguson continued to deliver trophies. From 2007 to 2009, United won three Premier League titles, lifted one Champions League trophy, lost a final and reached another semi-final. They won the League Cup, played in an FA Cup final and lost a semi-final. It represented the most prolific three-year spell in the club's history. Two more championships were won before Ferguson called time on his illustrious tenure. The Scot himself was a fervent champion of the Glazer regime, repeatedly praising the Americans for their stewardship. "Malcolm Glazer never set foot in Old Trafford but was a figurehead of that controversial takeover of Manchester United. "In terms of practicalities and the day-to-day running of the club, very little will change and the business will continue to be run on the same basis it has been for a number of years. "The club's debt payments have been reduced but I think it is fair to say fan anger over those debts remains and will not go away." There is debate about the precise words he used when confronted by fans at Budapest airport in 2006 ahead of a Champions League qualifier with Debrecen and questioned why he stood by a regime so loathed by supporters. Yet Ferguson was brutally dismissive. It remained that way until the Scot's retirement. Long-standing chief executive David Gill, who had opposed the Glazer takeover as "potentially damaging" but opted to remain once the deal was signed, said in 2012 that those who maintained their offensive against the owners were "anti-people". Yet many United fans looked beyond the silverware. They preferred to question the relative lack of spending on a squad growing increasingly inadequate to match major rivals Chelsea and Manchester City. Through it all, Glazer stayed away. Initially it was through choice, eventually ill-health. At no point did Glazer utter a word in public to either explain or defend his actions. The ownership of United has long since been transferred to Glazer's six children, with all the signs that the club will carry on its chosen path. Glazer's death happens to have come at the most uncertain period for United on the pitch since 2005, with David Moyes, the man chosen to succeed Ferguson, sacked before completing a single season and the club finishing in their lowest league position for almost 25 years. For this, some will blame Glazer outright. Others would prefer to imagine he never existed at all. Malcolm Glazer speaks to BBC Sport's Jonathan Legard in 2006. Glazer will not be missed by the rank and file in Manchester, but he will never be forgotten. Yet, for the strength of opinion against Glazer on this side of the Atlantic, in his homeland he is regarded as a positive figure. Flags flew at half mast at the home of Tampa Bay Buccaneers, the American football franchise he owned, while players and officials paid warm tribute. After all, the Bucs lifted the Super Bowl under Glazer's stewardship in 2002. Their new stadium was his responsibility, too. They may have been equally reluctant to speak in public, but in Tampa the Glazer family were afforded a warmth never replicated in Manchester. Why on earth buy a football club? Read more on Why on earth buy a football club? 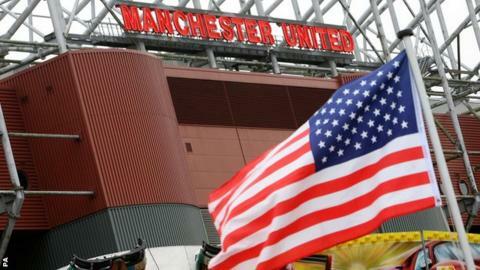 Man Utd: What is the price of European failure?